From one of the finest journalists of our time comes a definitive, boots-on-the-ground dispatch from the front lines of the conflict in Ukraine. Ever since Ukraine’s violent 2014 revolution, followed by Russia’s annexation of Crimea, the country has been at war. Misinformation reigns, more than two million people have been displaced, and Ukrainians fight one another on a second front—the crucial war against corruption. With In Wartime, Tim Judah lays bare the events that have turned neighbors against one another and mired Europe’s second-largest country in a conflict seemingly without end. In Lviv, Ukraine’s western cultural capital, mothers tend the graves of sons killed on the other side of the country. On the Maidan, the square where the protests that deposed President Yanukovych began, pamphleteers, recruiters, buskers, and mascots compete for attention. In Donetsk, civilians who cheered Russia’s President Putin find their hopes crushed as they realize they have been trapped in the twilight zone of a frozen conflict. Judah talks to everyone from politicians to poets, pensioners, and historians. Listening to their clashing explanations, he interweaves their stories to create a sweeping, tragic portrait of a country fighting a war of independence from Russia—twenty-five years after the collapse of the USSR. I enjoyed reading this book; I found it interesting and informative, and it was well written. 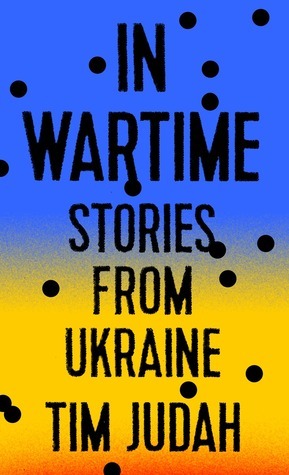 It describes recent and current events in Ukraine, focusing particularly on the experiences and opinions of people caught up in the conflict, although there is also a fair amount of background and historical context given. As I knew very little about Ukraine before starting it, this was very helpful. It probably would help to have known a little more before going in as I found it hard at times to keep track of the people and places mentioned, but this wasn't a great disadvantage. I liked the focus on telling people's stories; it helps to understand where people are coming from and the different viewpoints people have, and how they are affected by various events. The book also includes quite a few photos. There's definitely plenty of food for thought here as well. I'm afraid this isn't a very good review; I don't really know how to review non-fiction. But it was a good book and I would definitely recommend it to people who are interested in knowing more about the topic it covers. I probably won't be posting much, if at all, over the next week or two but hopefully will return in the New Year. Merry Christmas everyone!